I always think that one day I will have something interesting and exciting to share in there, sometimes I do though for the most part I don’t but I still like to talk about how the month went just so I can look back at it whenever I want, which I am sure I have talked about in the past. March has been a pretty good month though and I have some things to share, though I am not sure how exciting they will actually be but let’s share. I have been doing some major cleaning, decluttering and organizing during the month of March which has honestly been really great and felt really nice. I tend to hoard things and then somewhat frequently go through them to see if I really need them, and that’s what I’ve been doing. I feel a little bit strange about it but I really love organizing things. Sometimes I think I let things get kind of disorganized and a mess just so I have a reason to reorganize and refold things. That’s probably strange but it makes me happy. I just like getting new things and getting rid of things that I am no longer using, though I am trying to do better so it doesn’t hurt my budget too much. My best friend in the whole wide world came to visit this month and she stayed with us for five days, which I didn’t realize how much I actually needed, because it was a great visit and it also gave me a few days off from work to just kind of chill out, chit chat, shop and do all of those girly things that I just don’t get to do as much with other people. Also, we saw Captain Marvel and that was fantastic. And ate all of the food, which I have zero regrets over because it’s like vacation. Other than that, March has been pretty unexciting but it has felt like a really good month, a month of relaxation somehow and I feel like I really needed that. So now I am ready for the rest of spring and ready for April. Now, let’s recap my goals from last month starting with sticking to my budget, which shockingly I did not do. The Ulta 21 Days of Beauty really did me in, though I did a lot better than last month and didn’t break my budget too much, so this is good progress I think. Finishing Outlander is not something that I did this month, instead, I read various other books this month and didn’t even pay any attention to Outlander. The last goal was upping my social media presence which I kind of did but this is always a battle for me, I’m just not great at remembering to do this every day for a little bit. Now, let’s set some goals for April, starting with finishing Outlander and I know, this has been on my list for a while and last month I said that I for sure had this one, but I didn’t and I’m going to try once more. I will finish this book before the end of the year. I want to drive more this month, which is another endless goal of mine, I’m just not a driver but I really need to change that and focus on it. I want to stick to my budget this month, which will be less than last month but I think I can do that, especially since I have a lot planned for next month and I have a lot of new and old things to play with. I want to be more active on social media which is an always kind of thing, but I really need to focus in on this. How many of my goals will I actually do? Who knows, but I will try and I think that these goals do help me out some by knowing that I have to talk about it at the end of each month, well not have to but I do. 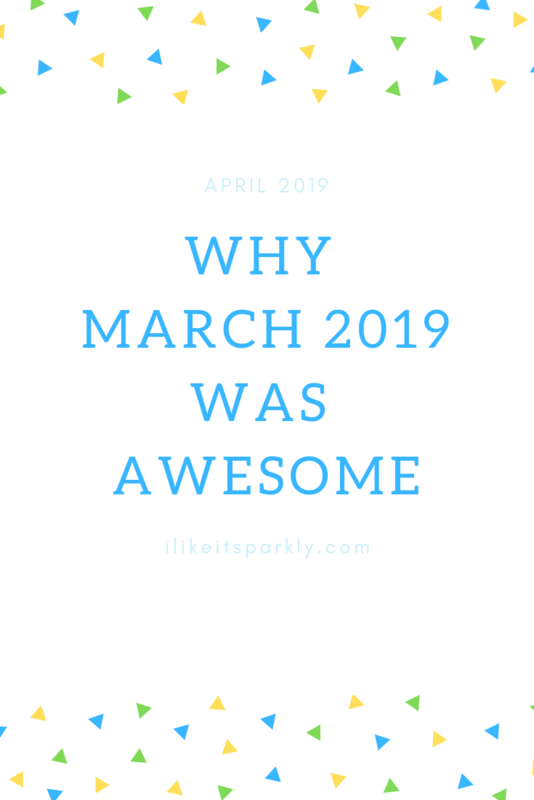 So, March was pretty great and I’m hoping April continues to be that way, which I’m sure it will since there will be more sun and more warmth.